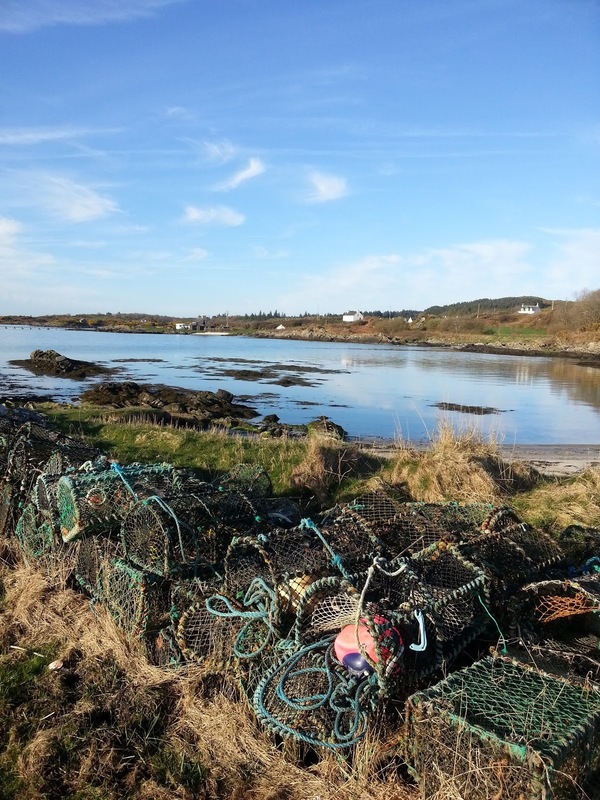 The maritime sliver of schist and quartzite that is the Isle of Gigha is an island of two coasts: a sheltered riviera of sandy bays on the east and a weathered and hardened west coast facing the Atlantic between Kintyre and the Oa of Islay. The central ridge of the island is wooded on the lee side and shelters most of the community around the hub of Ardminish and the old wooded Achamore. 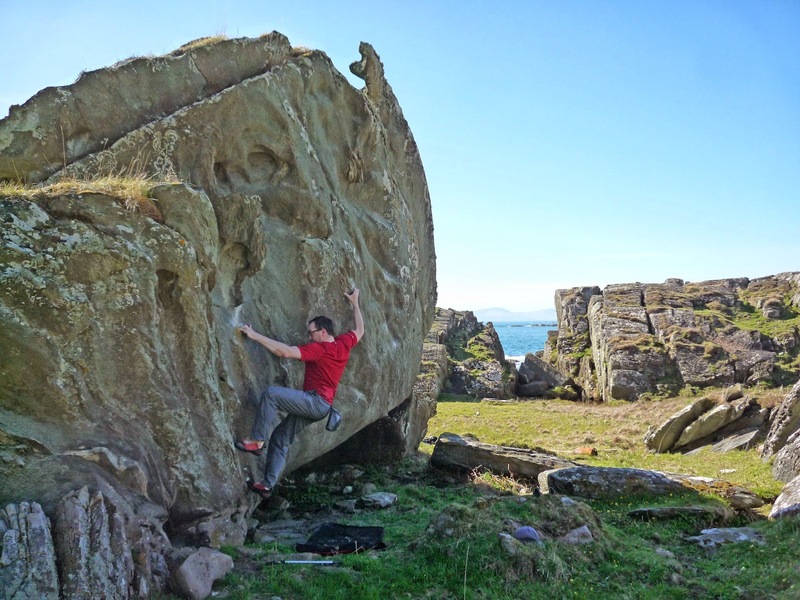 For climbers, the best trail is the west coast from the south pier to the summit of Creag Bhan, which is a day-long walk between ferries with some good climbing and bouldering, largely underdeveloped. The northern island of Eilean Garbh has some steep crags for sport-heads and a remarkable tombolo beach, polluted to hell with plastic on the drift side but postcard-perfect on the lee side. Walk up from the pier to the village shop at Ardminish, turn left and south past the hotel to the south of the island, past Achamore gardens and Gigha windfarm - the ‘dancing ladies’, four windmills as of 2014, 3 originally, a fourth was added in 2013. March 2014 output made £11,200 and this excess allows the Gigha Community Trust to profit from wind generation power, selling it back to the grid. The South Pier – splitting natural harbours of Port Meadhonach and Port na Carraigh - is where the ferry sleeps at night and is a deep berth opposite Gigalum Island. Walk south-west along the shore of Caolas Gigalum on a sandy bay, cross over a fence where it meets the rocks, then head up right onto the heathery hill by a wall, follow this south-west to where a small promontory juts out, on the south side of this is Uamh Mhor, the ‘big cave’, a well-hidden quartzite cave. Remains of a dun (or just a raised beach?) can be found on the boulder shore on the way to the cairn-marked craggy hill-top above Port Mor, opposite the three little islands of Eilean Leim, where the sea is usually rougher facing the westerly winds. Descend to the headland west of a rocky outcrop hill (Carn Leim), where a roaring cave can be heard, marked by a choked boulder in a chasm, this is Slocan Leim, the ‘leaping cave’, where in a strong westerly storm, geysers spout violently up around a choked boulder in the black gorge. In calmer weathers, pebbles turn and rumble with a deep bass in the hidden cave. North along the craggy headland by the high tide mark is another hidden cave, or blowhole, usually covered with seaweed blown up by the geyser of Sloc an t-Srannain, the ‘snoring hole’, though this might be more apt for the cave further south. The names might best be swapped around. A few hundred metres north leads to a stile onto the beach of Grob Bagh under Leim farm. This has a raised beach and an old spring at the north end, sometimes bleeding out an alluvial fan of sand. The beach bends west to a grassy shore and a gap through wind-exfoliated outcrops to a rocky coast west of Leim Farm, under the grassy hill of Am Pluc, full of unusual boulders worn into strange ships by the wind – this soft schist sits on top of a quartzite stone in parts. The skerry out to sea is Dudh Sgeir – the black reef. Continuing north past the reefs and islands of Port a’ Gharaidh to the slabby walls under the wind farm, where round hollows on the slabs show the site of a Quern Quarry. 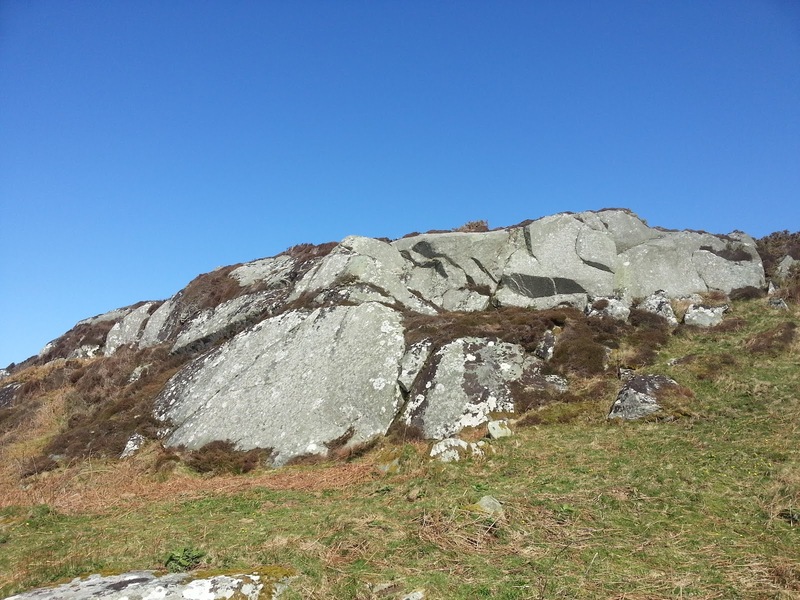 This garneted schist seems to have been ideal for making quern stones – they can be seen on slabs just before the bay and tidal island of Eun Eilean. Out in the bay lies the rocky Craro Island. Skirting the shallow sandy bay of Poll Mor (the big pool), where common seals roll and play in the turquoise waters, sometimes with attendant otters, is Port nan Each, a sheltered headland just under Cuddyport cottage (Tigh nan Cudainnean) with its sheltered ‘rock garden’. The west side of the headland directly under the cottage has a good series of slabbed amphibolite quern pits. The next headland is accessed along a beach to a path up to a Cairn or Cist, before the bay of Portan Craro, opposite Craro island. The wild headland walk leads eventually past some caves to Port an Duin, with its attendant farm and old mill. Above the bay a track leads up to the 100m summit of Creag Bhan, with some fine slabby crags on its west flank facing Jura and a steep cracked crag on its east flank. The summit trig point also has a marker plinth listing distances to Ireland, Kintyre, Arran, Knapdale, Jura and Islay, a fine vista on a clear day. The track leads down to a farm track east to Druimyeoin More farm and the road back south to Ardminish.